Since April, 2011 we have been working diligently to compile a special edition of the Black College Sports Encyclopedia to chronicle the history of Winston Salem State University athletics. Well, IT IS FINISHED!!! 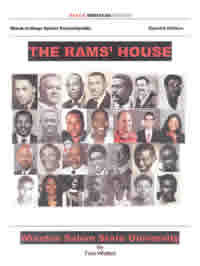 We have traced the history of the Rams from the 1920s and 1930s through the resounding victory that gave us our ninth CIAA Football Championship. Since returning to CIAA last year, the Rams and Lady Rams have collected eight CIAA crowns. They finished second in several other sports. Prior to last year, only the softball program had ever won a conference title. Now, there are championships in women’s tennis, indoor track and field, and cross country. The men’s cross country team also captured their first crown. We have gathered information on dozens of coaches and hundreds of athletes from all eras into a 240 page book. There are hundreds of photos gathered from our digital sports library along with some from the University and other recourses. Our aim is to show America the glory that has been the theme of WSSU over the past year. For instance, the last official victory in a wrestling match by a Ram resulted in an NCAA national championship. The stories of the Rams’ back-to-back NAIA Track & Field National Championships are documented. So is the NCAA Basketball National Championship. While many of you have never connected WSSU with golf, the Rams won the first eight CIAA Golf Championships. Presently we are completing the final edit and have a press date set for December 1, 2011. The first copies will be ready for shipment two weeks later. We are asking you to place your order online, or, clip and the order form immediately. This will make a great Christmas gift for family and friends. Or, just get one for you to yourself. Our website is – www.blackheritagereview.com. Click on The Rams’ House to get to the proper page. Please help us make this a success by forwarding this to your contact list. We have one of the greatest untold stories when it comes to athletics. While others boast, we now have the fact our facts in print. We have grown from the little “teachers’ college” to a viable university. A major component of that growth was athletics. Many of our greatest alumni came to WSSU because of athletics. Now, they are making their marks in many other areas. To order by mail, use the form here.